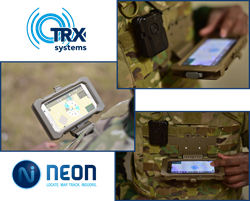 TRX Systems, provider of NEON® GPS-Denied Location and Mapping Solutions, today released an offline version of its Personnel Tracker Solution compatible with the Android Team Awareness Kit (ATAK) and other secure mobile applications. The new NEON solution is deployed with an Android APK and Tracking Unit that operate offline, without an internet or cloud connection. The NEON Android API supports integration with third-party applications, delivering safety and situational awareness for warfighters and security personnel operating over secure networks. NEON Personnel Tracker is a low SWaP, location and tracking solution that delivers continuous location both indoors and out when dismounted personnel are operating with and without GPS in both naturally and intentionally denied environments. Leveraging GPS, body-worn sensors, RF ranging, and available map data, Personnel Tracker is an extensible solution easily integrated with third-party situational awareness applications. TRX Systems is the developer of the NEON® Location Solution, delivering 3D location and mapping indoors, underground and in dense urban areas where GPS is not available or is unreliable. NEON delivers ubiquitous, low-cost, GPS-denied location through the use of advanced sensor fusion, ranging, and patented dynamic mapping algorithms. NEON patented location technology provides the foundation for a number of commercial applications including NEON Personnel Tracker and NEON Signal Mapper, delivering 3D location indoors, underground, and where GPS may be intentionally denied. TRX Systems is the recipient of the Silver Edison Award for Innovation in the Navigation and Robotics category, the Tibbetts Award given by the U.S. Small Business Administration for Innovation and Economic Impact of Research and Development, the TEDCO ICE Award for Corporate Excellence and the Innovator Award from the Chesapeake Regional Tech Council (CRTC). TRX's location software development has been supported by the National Science Foundation, the Defense Advanced Research Projects Agency (DARPA), the U.S. Army, the U.S. Air Force, and the Department of Homeland Security. *The NEON ATAK plug-in is supplied only to users of the ATAK application (i.e., U.S. Government controls distribution of the ATAK application).